Step 1 In a large food processor, combine the hummus ingredients of garlic, chickpeas, avocados, Greek yogurt, tahini, salt, cumin and lime juice. Blend until the hummus mixture is smooth. Test, and if the hummus is too thick, add a very little bit of water (or chickpeas canning liquid); run the processor until you achieve the desired creamy consistency. 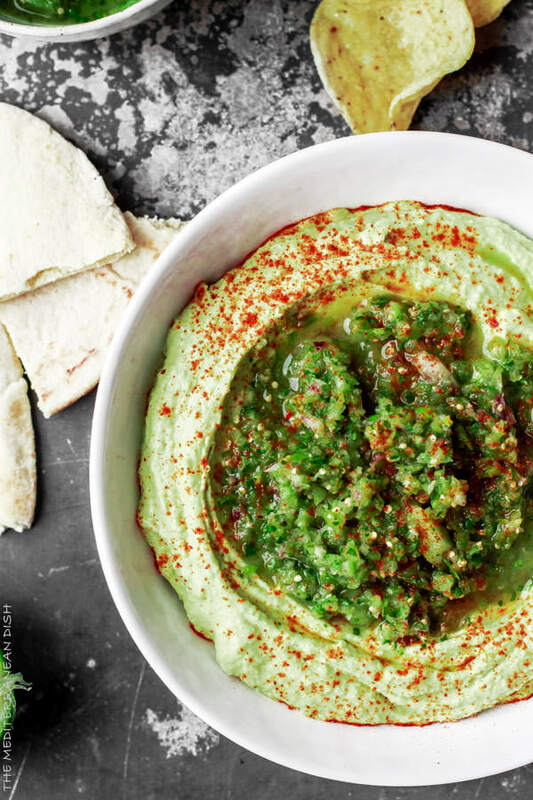 Transfer the avocado hummus to a serving bowl; garnish with cayenne pepper; cover and refrigerate for a few minutes. Clean the food processor. Step 2 In the now cleaned and dried food processor, combine the salsa ingredients of tomatillos, cilantro, garlic, onions, jalapeno, salt, pepper and lime juice. Run the processor for about 40 seconds. Check, and if needed, blend for a few more seconds until you achieve the desired consistency. Step 3 Top the avocado hummus with 1/3 cup of the salsa verde (drain the salsa well before placing on the hummus). Transfer the remaining salsa to another bowl. Serve with tortilla chips and pita bread or pita chips! Enjoy.